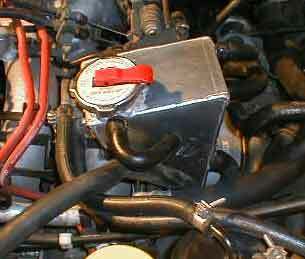 Ah, that little black box with the radiator cap on top. As mysterious as it is to those who don't know its purpose, it's equally frightening to those of us who must work around it. A few questions come to mind when i think about this little reservoir: why is it there? why is it so oddly shaped? why does it break all of the time? These questions are simple to answer. It's there so that coolant can flow between it and the turbo in a convection current when the car has been turned off, probably due to mounting and clearance issues, and heat. In my recently aborted Air-Water intercooler project, i was wriggling the Legacy intercooler back and forth, trying to get it to fit better, when i heard a "snik" and smelled the sweet odor of antifreeze. All i had to do was look right down and see the coolant flowing out to realize it was all over. Expletives followed. 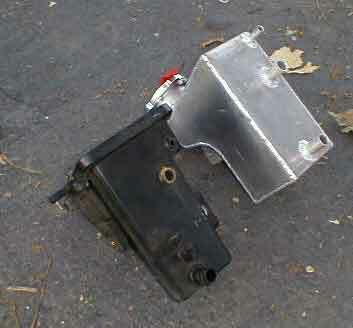 Not to fear, however, as Kevin from JC had sent me one of their new aluminum tanks along with the Turbo intake kit. This is a part that i've recently seen two people break, and the replacements from dealerships or online warehouses aren't cheap, sometimes ranging as high as $300. I'm not sure what JC is charging for this replacement, but for its looks, durability and capacity, it's gotta be a steal! 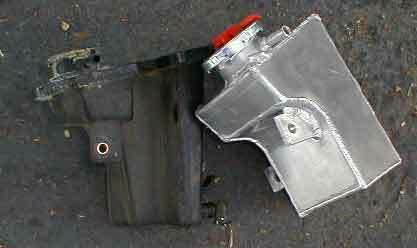 The reservoir itself has just two bolts mounting it on, one facing the driver side fender and another in the back, facing the firewall. Strangely they're different sized heads, 10 and 12mm respectively, but not too hard to get to. Next are the 3 lines. 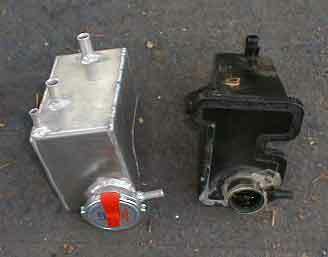 The most important one goes directly to the turbo, and it's the one that causes all the problems because of heat. In trying to get the rest of the plastic out of the inside of the hose, i was astonished that the plastic in the turbo hose had the consistency of cardboard. It was all i could do to take it out in chunks. 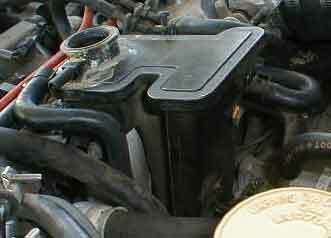 The heat and coolant really had done a fine job breaking down the plastic. After i removed the old tank, i put the two together on the pavement and made a few observations: The old tank is REALLY wierd shaped and the new tank probably has twice the capacity! 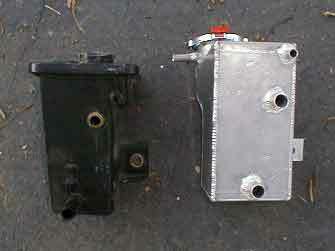 The new unit isn't exactly professional grade with nice molded contours and polished welds, but it does the job well. Also, you'll have to find a new cap as well. I went to Autozone and found out what pressure the stock one is, then got a larger one with similar pressure ratings. Perfect fit! As for install, it's basically the reverse of removal. Everything fit in just fine and all the hoses went in well. Finally, make sure and add about a litre of water/coolant to your overflow bottle, if possible, to make up for what you lost and the capacity gaines with the new tank. 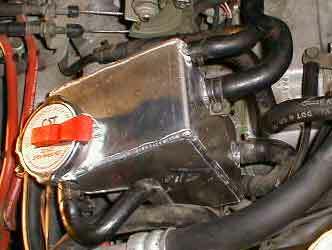 Apparently JC has an even newer version with the hoses rerouted to avoid interference with intercoolers. I've not seen it yet, but i'm sure it'll work just as well as this one. Be even more prepared to explain what it is when you've got your hood open now!